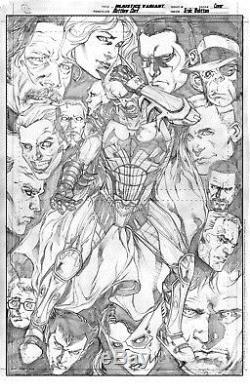 This is the pencil cover art for Injustice season 4 #1. Matthew Clark is the artist and the cover is a homage to Strange Adventures #207. 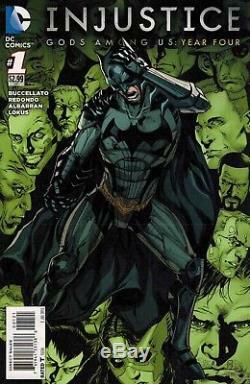 Its featuring BATMAN on the cover surrounded by heads of his former teammates and villains killed in the series. Nightwing, Deadman, Green Arrow, Detective Chimp, Captain Atom, Joker, Huntress, Danny Trejo and others. It's drawn of standard issue DC comics illustration board the art itself if just over 10 by 15, drawn with a 2h lead. The item "Original comic book cover art" is in sale since Thursday, April 05, 2018. This item is in the category "Collectibles\Comics\Original Comic Art\Covers". The seller is "night_artist" and is located in Portland, Oregon. This item can be shipped to United States, Canada, United Kingdom, Denmark, Romania, Slovakia, Bulgaria, Czech republic, Finland, Hungary, Latvia, Lithuania, Malta, Estonia, Australia, Greece, Portugal, Cyprus, Slovenia, Japan, China, Sweden, South Korea, Indonesia, Taiwan, South africa, Thailand, Belgium, France, Hong Kong, Ireland, Netherlands, Poland, Spain, Italy, Germany, Austria, Israel, Mexico, New Zealand, Singapore, Switzerland, Norway, Saudi arabia, Ukraine, United arab emirates, Qatar, Kuwait, Bahrain, Croatia, Malaysia, Brazil, Chile, Colombia, Costa rica, Panama, Trinidad and tobago, Guatemala, El salvador, Honduras, Jamaica.